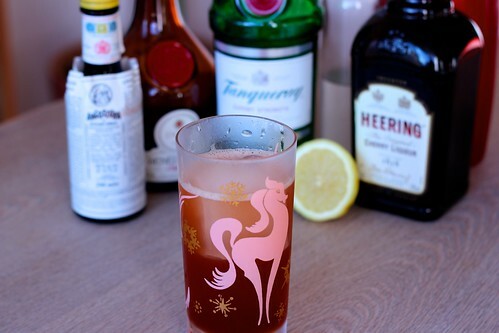 The Singapore Sling is one of those classic drinks where the recipe ends up all over the place. There is a lot of murkiness around the original recipe, and the variants since then. I’ll leave it to others, like David Wondrich, to walk through the history of it all. The main differences we have in our three books lie with the Savoy not using Benedictine, and the different proportions. Once again, the Lommebogen recipe looks like it is going to come out the sweetest, since it is using sweet and sour instead of just lemon/lime juice, along with both of the other sweeteners: cherry brandy and Benedictine. The history of the general family of Slings is also a bit confusing, but it seems that back in the day (i.e. the 1800s) Slings were just sweeten spirit with water. You can see they’ve gotten a bit more fancy over time, and generally Slings use soda water instead of plain water. If you want a lot more information about what Slings are/used to be, and their history with the Toddy, check out Musings on Cocktails. Either way, today the Singapore Sling is probably the only known, and regularly made, sling that has come down the years. Serve over 1 lump of ice. (I used one big ice cube from my Tovolo King tray.) Also, as noted in many recipes, and David Wondrich’s article above, the cherry brandy is a liqueur, like Cherry Heering, and not a spirit, like kirschwasser. This looks pretty sweet on the tin, and all of three of these recipes played out that way. It’s too sweet for my tastes, but I can see why this would be a crowd-pleaser at a party. Of the three, the Savoy version is the easiest, but I think the Café Royal is my “favorite,” perhaps due to the lime juice and the more even split of Cherry Heering and Benedictine. That’s splitting some fine hairs though, for a drink that I’m not really that razzed about.